Mr Horace Valvona started the Safe Cycling Scheme when he was County Road Safety Officer. 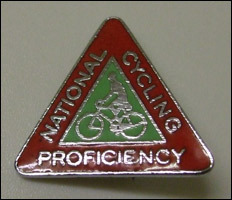 It began in 1955 and over the next 12 years 165 girls cycled with the team. The Safe Cycling Team lead by Mr Valvona was unique and the aim of the team was to promote safe cycling. The team practised on the tennis courts at the new block, the precision cycling was set to music, which came via speakers that Mr Valvona carried in the back of his car. The team would take part in local carnivals, also giving displays at local schools. A trip to London’s White City stadium to give a display in front of the Duke of Edinburgh was quite a special occasion. The uniform for the cycling team was white shorts and white P.E. tops and quite possibly the dreaded red beret ! The cycling team went on many outings, the photo shows the team with the local M.P. 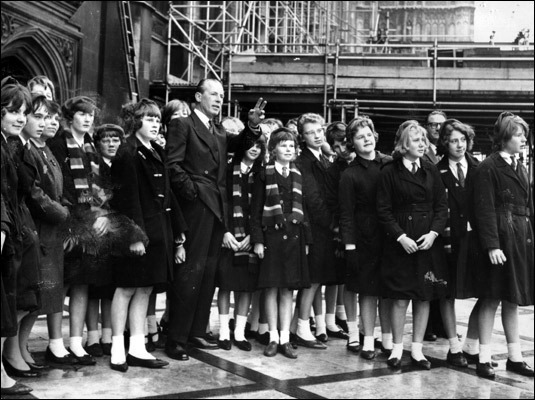 taken on the balcony of the houses of Parliament possibly in 1963, a visit to R.O.S.P.A house was also included in this outing. The Girls school uniform at this time was navy blue gabardine macs, red berets, navy blue, red and gold striped scarves and of course the red beret usually held on with grips!!! Linda Watts, Marlene Holt, Hilary Ambridge, Mr Valvona, Margaret Ablett?, Lobelia Gazeley ? rally attended by the Duke of Edinburgh. Part of the demonstration given by the cyclists is featured this week on Pathe News at local ABC cinemas. Norah Bridgeford, Sandra Attley, Elaine Smith, Anita Ridgewell, Lynda Tompkins, Davina Sharpe, Wilhelmine Harris, Diane Young, Kathleen Hoodless, Maureen Parker, Helen Martin, Marlene Holt, Christine Watts and Valerie Travill. Also in the picture is Mr. Horace Valvona, road safety officer.